Rose is one of nine graduate students featured in Michigan Engineering's #HerEngineering, on Michgan Engineering's Website , Twitter , Instagram , and Facebook. Rose presents her work at the March Meeting of the American Physical Society. Rose is named the recipient of the Biointerfaces Institute (BI) Student Innovator Award . She will give a talk and receive her award at the Biointerfaces Research Day. Rose's work, entitled Pressure-tunable photonic band gaps in an entropic colloidal crystal is published in Physical Review Materials. Rose presents "Pressure-Tunable Photonic Band Gaps in an Entropic Crystal" at Materials Research Society Fall Meeting in Boston, MA. Rose presents "Pressure-Tunable Photonic Band Gaps in an Entropic Crystal" at American Institute of Chemical Engineers (AIChE) Annual Meeting in Pittsburgh, PA.
Rose is awarded an Honorable Mention for the Towner Award for Graduate Research at the University of Michigan. Rose is awarded the Charles G. Overberger Award for Excellence in Research at the University of Michigan at the Macromolecular Science and Engineering Symposium. Rose presents a symposium entitled "Designing Particle Shapes for Self-Assembly of Novel Colloidal Crystal" at at Oxford University in Great Britain. Rose presents "Pressure-Tunable Photonic Band Gaps in an Entropic Crystal" at Anisotropic Particles Symposium in Konstanz, Germany. Rose presents a symposium entitled "Designing Particle Shapes for Self-Assembly of Novel Colloidal Crystal" at at `Ecole Polytechnique Lausanne (EPFL) in Lausanne, Switzerland. Rose presents "Pressure-Tunable Photonic Band Gaps in an Entropic Crystal" at Self-Assembly of Colloidal Systems in Bordeaux, France. Rose presents "Tunable Photonic Band Gaps in an Entropic Crystal" at Foundations of Molecular Modeling and Simulation (FOMMS), Delavan, WI. 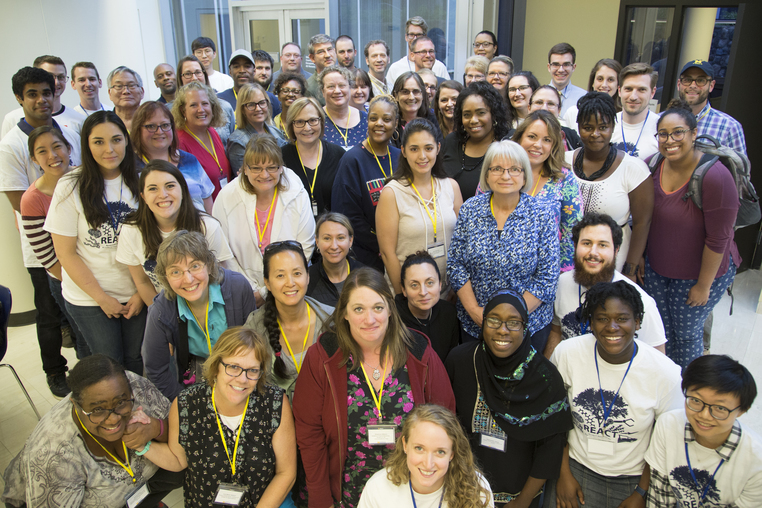 Rose hosts 53 teachers to UM campus to experience UM research for the second annual REACT workshop, with participation spanning across 10 departments and including over 30 volunteers. The Michigan Engineer writes "STEM education: A taste of research for K-12 teachers" detailing the event, with additional images at <a. REACT has made all workshop materials (videos and lesson plans) available on the REACT webpage and YouTube. Rose is announced as a Rackham Predoctoral Fellow , one of the most prestigious awards granted by the Rackham Graduate School. Rose presents "Tunable Photonic Band Gaps in an Entropic Crystal" at Americal Physical Society (APS) March Meeting in Los Angeles. Rose's work entitled Relevance of Packing to Colloidal Self-Assembly is published in the Proceedings of the National Academy of Sciences and covered by phys.org. Rose is awarded the North Campus Martin Luther King Spirit Award at the University of Michigan for her work with the Detroit public school system. Rose presents "Distinguishing Packing and Assembly Behavior via Phase Transitions in Shape Space" at AIChE Annual Meeting in Minneapolis, MN. Rose is awarded the Nonna Hamilton Student Service Award at the University of Michigan at the Macromolecular Science and Engineering Symposium. Rose is named a Student Ally at the University of Michigan for the Diversity, Equity, and Inclusion Strategic Plan. Rose's work entitled Augmenting Primary and Secondary Education with Polymer Science and Engineering is published in the Journal of Chemical Education. 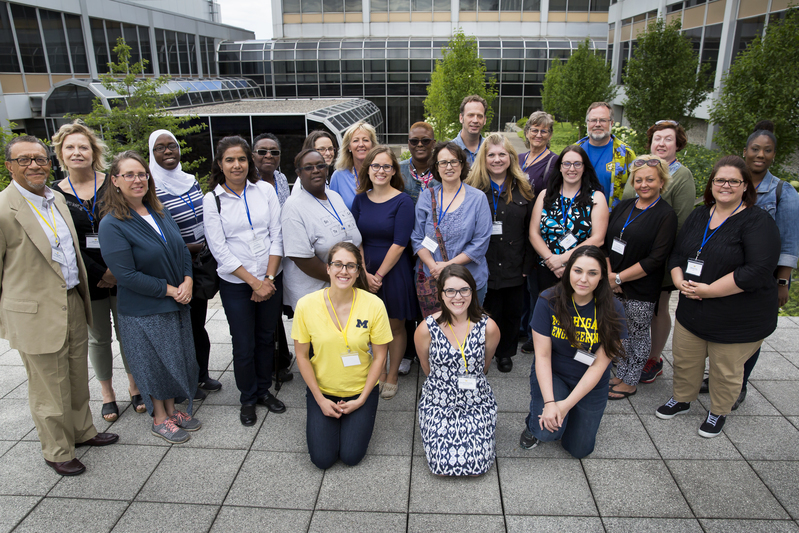 Rose hosts the inaugural workshop "Research Education and Activities for Classroom Teachers" (REACT), bringing 19 teachers from across Michigan to interact with UM research. This event is covered by the Center for Educational Outreach: "UM Graduate Students REACT", with additional photos found here. Rose presents "Distinguishing Packing and Assembly Behavior via Phase Transitions in Shape Space" at Materials Research Society (MRS) Meeting in Phoenix, AZ and wins 2nd place for student presentations! Rose presents "Augmenting Primary and Secondary Education with Polymer Science and Engineering" at American Chemical Society Meeting in San Francisco, CA, where her ACS POLY/PMSE Student Chapter wins Chapter of the Year! Rose presents "Distinguishing Packing and Assembly Behavior via Phase Behavior in Shape Space" at APS March Meeting in New Orleans, LA. Rose presents "Distinguishing Packing and Assembly Behavior via Phase Behavior in Shape Space at Engineering Graduate Symposium, University of Michigan, Ann Arbor, MI and wins 3rd place for posters! Rose presents "Understanding Spatial Packing Through Variable Shape at Macromolecular Science and Engineering Symposium, University of Michigan, Ann Arbor, MI. Rose finishes the Baltimore Marathon in 4:23:02. Rose wins the Prof. Albert and Mrs. Yee Student Leadership Award. Rose presents "Understanding Spatial Packing Through Variable Shape at Michigan Institute for Computational Discovery and Engineering Symposium, University of Michigan, Ann Arbor, MI and wins 3rd place for posters! 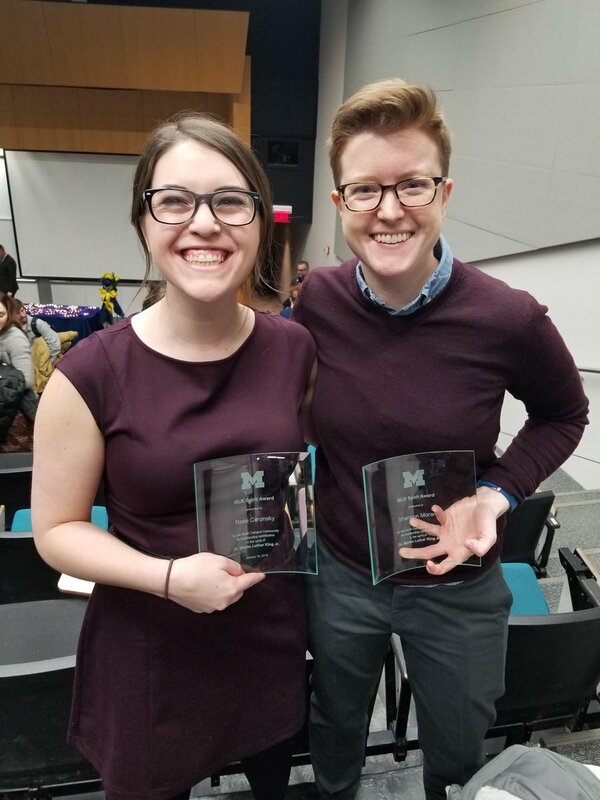 Rose presents "Shape-Based Molecular Dynamics Investigation of Protein Crystallization at Macromolecular Science and Engineering Symposium, University of Michigan, Ann Arbor, MI and wins 1st place for posters! Rose performs in "Big Fish" at the Croswell Opera House in Croswell MI. Rose presents "Shape-Based Molecular Dynamics Investigation of Protein Crystallization at Soft Matter Summer School, University of Massachusetts, Amherst, MA. Rose starts the Outreach Initiative within the ACS POLY/PMSE Student Chapter at the University of Michigan. Rose is awarded the Rackham Merit Fellowship. Rose is named a fellow of the Michigan Institute for Computational Discovery and Engineering. Rose starts her PhD at the University of Michigan researching under Prof. Sharon Glotzer and is awarded the Michigan Institute for Computational Discovery and Engineering Fellowship. UConn Materials Science and Engineering writes an article on Rose covering her work and achievements at UConn. She is also mentioned in the UConn Article "A Class of Championship Caliber". 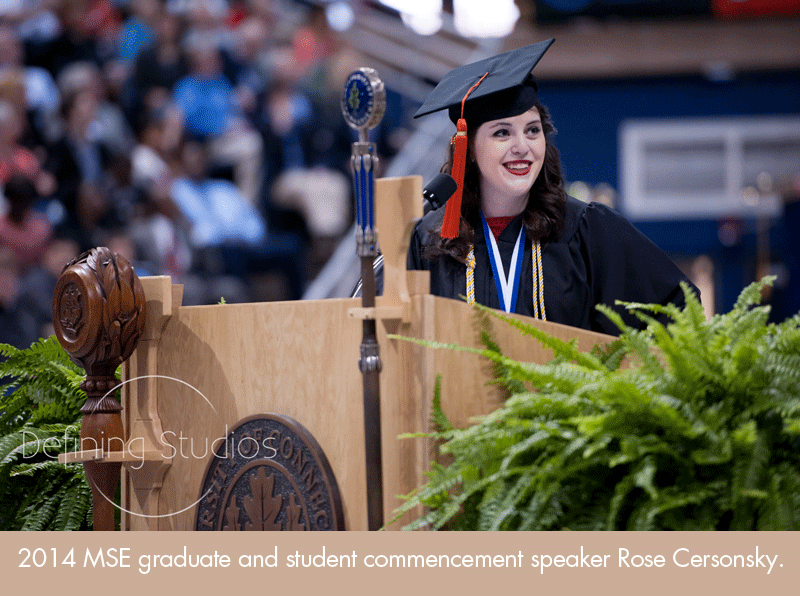 Rose graduates University of Connecticut with a Bachelors of Science in Engineering in Materials Science and Engineering! She gives a commencement address focused on maintaining sight of the human component to engineering. Image taken from mse.engr.uconn.edu. Rose wins the Outstanding Academic Achievement Award for the School of Engineering at the University of Connecticut. Rose presents "Design Rules for Composites from RTM Polyimides at the Senior Design Exposition, University of Connecticut, Storrs, CT.
Ph.D. candidate in the Macromolecular Science & Engineering Program at the University of Michigan, Ann Arbor.